Not sure what to do with all the information overload from visiting AAPEX 2018? We don’t blame you - it was a big show this year! We’ve compiled the following helpful steps to follow now that you’ve settled back into your normal, post-show schedule. 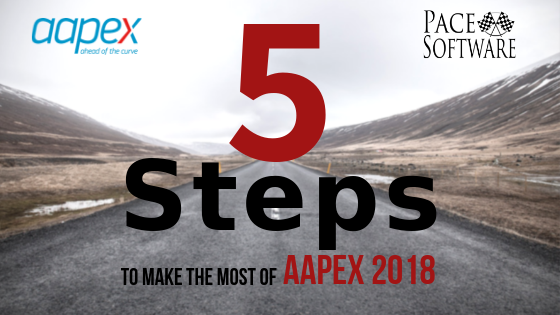 If you attended AAPEX with a goal in mind but can’t seem to tackle the next step in your process, this list is for you. Sort through all the literature and giveaways you accumulated. SWAG, business cards, pamphlets, flyers, t-shirts… sort through what you plan to keep and what will end up in a pile with the rest of your branded tradeshow giveaways. Anything you know will go unused should be donated or offered to others at your company who didn’t get to the show. More importantly, take time to sort through literature and business cards. Recycle anything that isn’t relevant to you and keep the rest for follow up. Write down meaningful conversations. Sort through the literature and business cards you decided to keep and write down notes on the people you met and what you talked about. If you got a business card, attach it to your notes so you know who to contact when it’s time to get in touch! Check your email. Chances are, if your badge got scanned at a booth, you now have an email (or a few) from that company. Check your inbox, spam, junk and clutter folders for emails from the companies on your list. They’ve most likely already reached out with next steps regarding your conversation. Do your research. Now it’s time to do some background research on the companies that stood out to you and their product offerings for comparison. Any information you can find on the web will save you time down the road when it’s time to buy! Write down any questions that come up during your research, so you remember to ask them when you see a demo. Sales representatives love informed customers who know what they want. Get in touch. Call the numbers on the business cards or email the companies for information you can’t find online, such as quotes, personalized demos and special offers. You never know what’s available until you ask. We know your research led you to put Pace Software at the top of your list of software providers to contact, and we’re happy to hear from you! Fill out this form or call 941-742-6400 to schedule an in-depth conversation with one of our sales reps, who will be happy to help you find the right solution for your business. There you have it. We hope these steps will make the chaotic task of sorting useful information from the rest a little bit easier. Soon you’ll be on the path to fulfilling your original goal for AAPEX! Let us know in the comments below if these tips were helpful to you or share your favorite way to get organized post-trade show.